How can I import classes from Google Classroom? If you have a Google Classroom account, Quill will automatically import your classes and your students can log in with their accounts.. 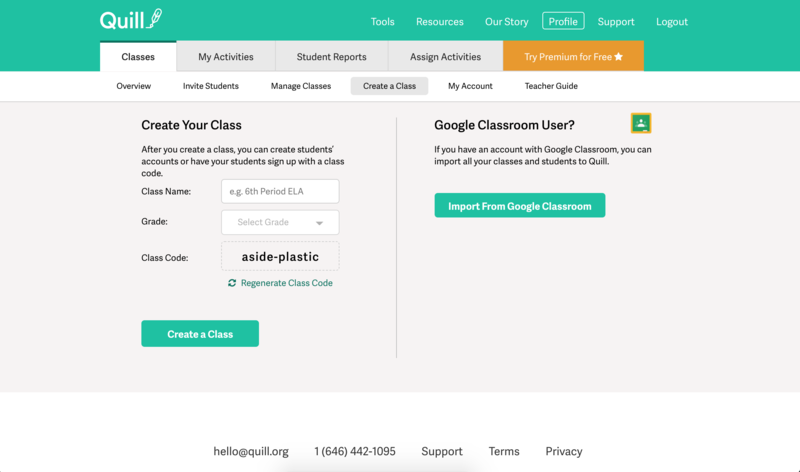 If you sign up with your Google Classroom account, Quill will automatically import your Google Classroom students into Quill. If you did not sign up with Google Classroom, you can still import your students. To do so, navigate to quill.org/teachers/classrooms/new and click the 'Import From Google Classroom' button on that page. This will allow you to update your email address if necessary and choose the classrooms you'd like to import. This process may take up to five minutes to complete. Make sure to sync your Google Classroom, so that newly-added students in your classroom show up in Quill. My Google Classrooms are from last school year. Should I wait until I create new classes to begin? Yes, if you’re planning to use your Google Classroom classes with Quill, you should import those classes into Quill before you assign activities to them. However, if you’d like to start your classroom planning now, you can create unlimited demo classes to explore and select the content you’d like to use.